I felt the call to become a chiropractor years before I had my first adjustment. Looking back I’ve come to believe all of my life experiences have helped me along this journey. This is my path and I’m grateful and humbled by the thousands people who have walked this journey with me over these first 15 years of my career. Occasionally I’m asked, “Doc, if you weren’t a Chiropractor, what would you do?” The truth is I have no idea. I can’t fix a car, I’m not handy at home. I am not skilled with technology. But I’ve always liked to help others, this, I can do. So when I think about it, serving humanity as a Chiropractor may be the only skill I have. I enjoy Judo, Jujitsu and many sports. But honestly, my favorite thing to do is to talk to people and learn their stories. Once forbidden as a child, I now talk to strangers. It fascinates me and makes me appreciate this human experience. My career in working within the chiropractic field started by accident. I graduated as an RMA (Registered Medical Assistant) in 1996. 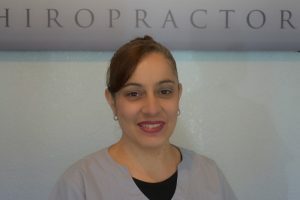 At the time one of my first jobs was in a chiropractic office. I told myself that I would work there for a year or two to gain experience and then move onto something with heavy concentration in the medical field. Here I am 22 years later still working in a chiropractic office and I couldn’t be more happy about it! I have learned so much during my years as a Chiropractic Assistant. I see miracles happen all the time. I am so grateful for all that I have learned and all the patients that I’ve had the honor on getting to know. I am especially grateful for Dr. Joly and our team. I have been married for 20 years. I have 4 children ages 18, 16, 13, and 10 (2 boys; 2 girls). On my own time I enjoy reading and exercising. One of my favorite things to do is to take long walks. I especially love spending time with my family. I appreciate it even more now that my children are older and they now have their own responsibilities. What truly inspired me to work at a chiropractic office? Well, the story may not be as simple as it seems. I became a patient of Dr. Joly’s at the age of 8. Through a series of adjustments, I saw my overall health improve. Now, Even if I wanted to I probably would not be able to hide from Dr. Joly ( haha ). 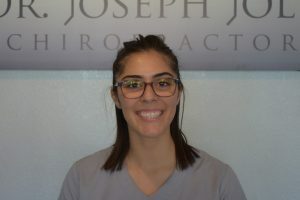 I worked as a chiropractic assistant for a year, later went off to college to pursue a marketing degree and saw my return to Joly Chiropractic after college. This time, I am seeking to grow Dr. Joly’s practice and educate the community. Although Chiropractic care is understood as cracking bones, a lot of people do not see it as a holistic way to prevent, cure, or minimize many illnesses and injuries. My passion in working for Dr. Joly is that he takes all measures necessary to prevent the use of medication or surgery. I am one amongst many of the testimonies that has seen this first hand. Whether it is Dr. Joly or another Chiropractor, we want you to be informed and educated about the benefits of chiropractic care. Although I may not be in office as much, I am working hard behind the scenes to help Dr. Joly pursue wellness for the community. San Francisco State University, Marketing B.S. Because I spent a good amount of time out in Oregon, I seek to find the hidden treasures this planet has to offer. Lucky for me, I have a great surrounding community that likes the vast outdoors. In addition to the outdoors, music has always been one of my passions. . . despite the lack of my vocal capabilities. My career with Dr. Joly started about four years ago. I have known him since I was about 7 or 8 when my mom began bringing me in for adjustments due to injuries from dance. My career with Dr. Joly started about four years ago. After two years of working with Dr.Joly I went back to school to obtain a Dental Assistant Certification. Although I enjoyed being a dental assistant, deep down I knew I wasn’t meant for the dental industry. 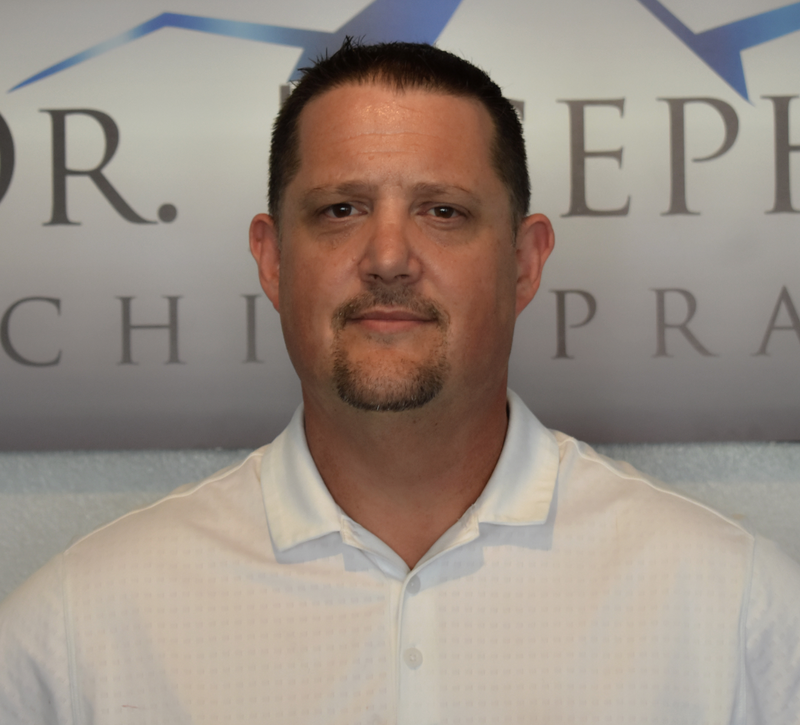 The opportunity to work with Dr. Joly was presented to me and I knew that was life giving me the opportunity to come back to Joly Chiropractic. I came back with a new skill set and am ecstatic to be working with Dr.Joly, the patients, and our team. A few things that I enjoy doing are dancing, working out, and reading books. Working out and staying active has always been a significant part of my life because I find it important to care for your body which is reflective to significant health benefits. I also love going to Disneyland!